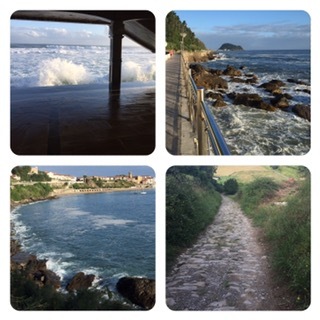 Am on the north coast of Spain, today one of the best Camino days: 26 km (16.3 mi) of steep climbs and descents that created unforgettable views of the local landscape and ocean coast, with cool weather, great paths–some rocky, but no mud. 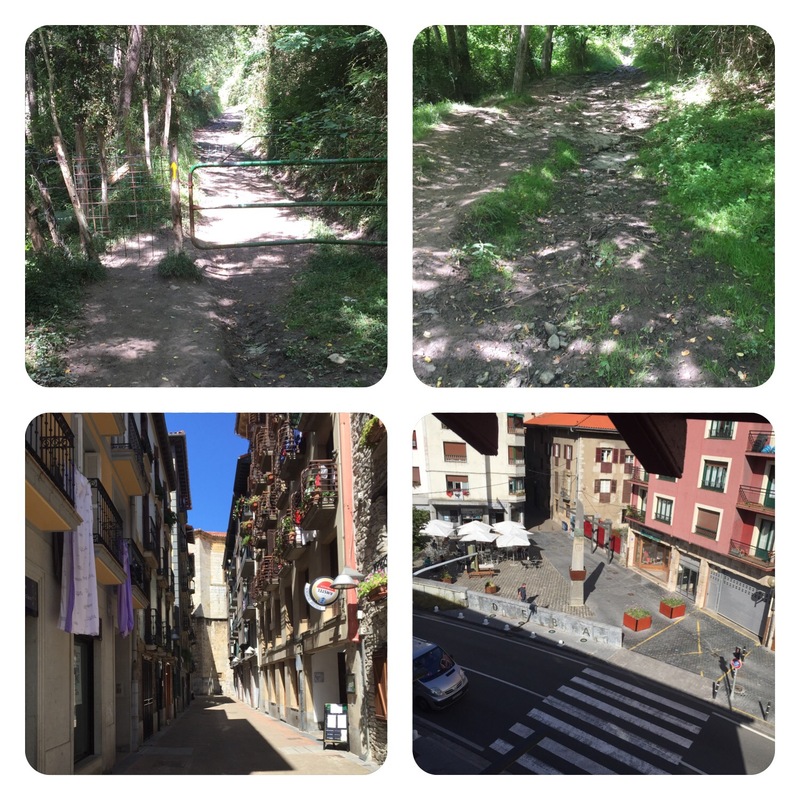 At the end of the day I felt a genuine Camino accomplishment. Although I had a few moments of doubt, I feel I can make this route–I love it because it reminds me so much of California’s Pacific Coast Route. The land kisses the sea and the sea hisses back in a continual, unpredictable motion with forces beyond one’s imagination. Deba has a long history of being a port town, but it already remade itself into a tourist attraction as early as the 19th century. It offers tourists and pilgrims alike a quaintness and resting place to enjoy. The view from the second story is from our albuerge as I lust after the beers folks are having below. A 21.2 km (13.3 mi) day, much of it uphill, half in the rain, a fall in the mud that bent my walking stick left me with one of the warmest of memories and it’s the only pic I’m attaching. 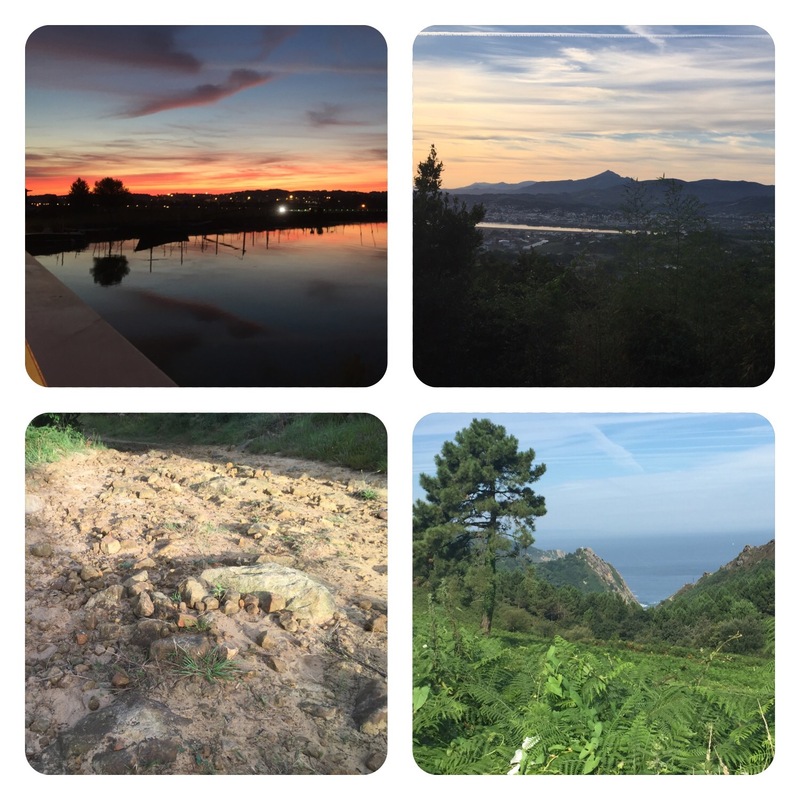 Today I started out at sunrise and it was my Camino entrance exam: only 18 km (11.3 mi) but the climbs and descents taxed me most along with a rocky path for much of it. On a pass/fail basis, I think I passed. Oh, there was also a patience part. When I called to make a reservation, the fellow told me they were full and I need to go to the Corazon de Maria and they will provide me with a bed. So I imagined this completely different place, Googled it, and went on a two-hour chase into the steepest parts of San Sebastián that was the wrong place! My energy and patience were nearly gone. It turned out, the place I called was the Corazon de Maria, and they didn’t even take reservations! When I arrived there they were still closed, and I easily got a front-row bed–I’m facing a basketball court. The place is huge with rooms elsewhere, too. Right now they have 80+ pilgrims. The views from the walk as well as my “extra sightseeing” were gorgeous. The hills on the other side are the Pyranese. The cathedral, the El Pastor Cathedral, while relatively new (1897) is one of San Sebastián’s major icons. As Seniora Socorro drove her husband to an appointment, she offered to drive me to the Chemin de St Jacques, their house being somewhat off the route. 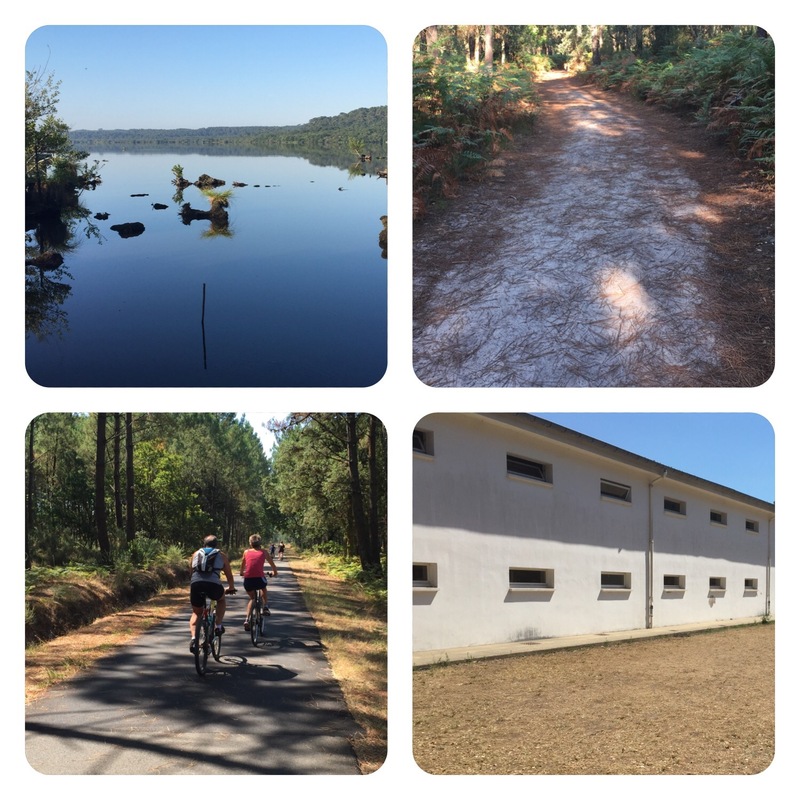 Well, that offer turned into a tour of the area that ended up taking me 33 km “down the road” to Saint-Jean-de-Luz. And from there I walked a short 14.4 km to Irun–yes short, but with some steep climbs that gave my tendinitis a good test. So far so good. Although I won’t be crossing the Pyrenees mountain range, some of its rolling mountains were visible in the distance. Biarritz was most interesting with its conspicuous wealth everywhere especially the Hôtel du Palais originally built for Emperor Napoleon III’s wife Eugénie. 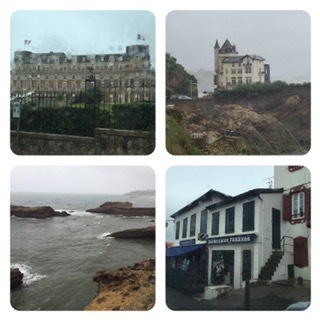 Somehow, the Chemin de St Jacques is conspicuously not routed through Biarritz! At the town of Budart, one could see the Basque language and architecture everywhere. 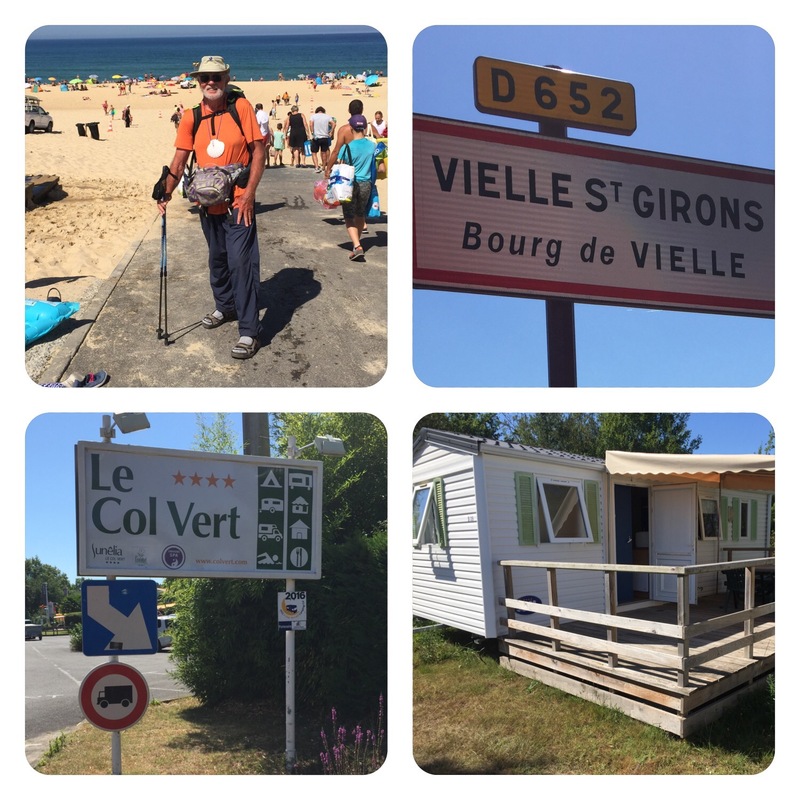 Walked the 5.9 km (4 mi) to Bayonne when I decided to stop at the Office de Tourisme to see if they could get me lodging at Bidart, my planned goal for the day (17.8 km). The lady called her counterpart and the result was that nothing was available except very high-priced vacation hotels. 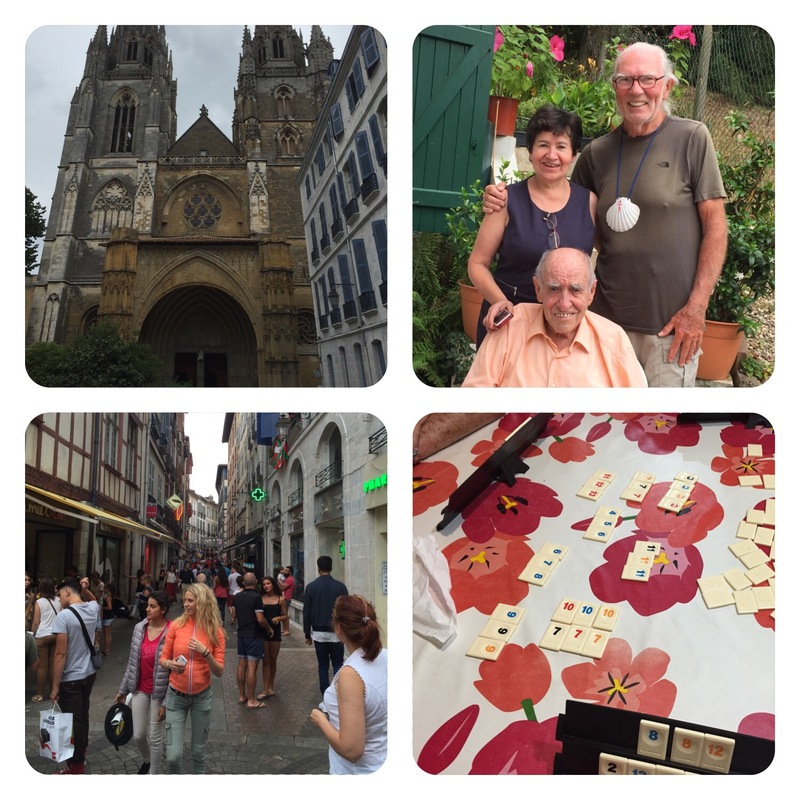 She highly recommended to stay in Bayonne, the last French city to cater to pilgrims. I took her advice and she found a chambre d’hôte within a kilometer or so. 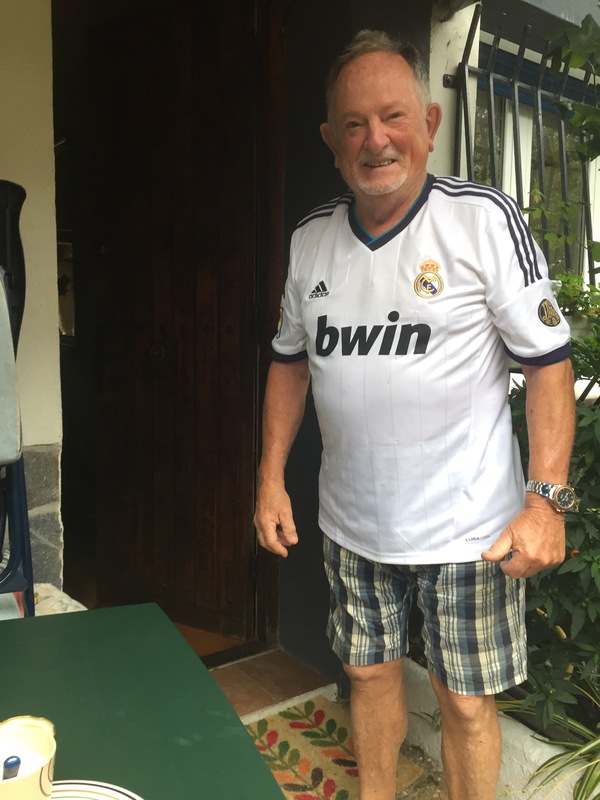 As luck would have it, I arrived at the Aguirre Family’s place called “la Gayonette” and both speak fluent Spanish, he stemming from Bilbao and she from Colombia, South America. It’s a perfect opportunity to train my ear for Spanish. 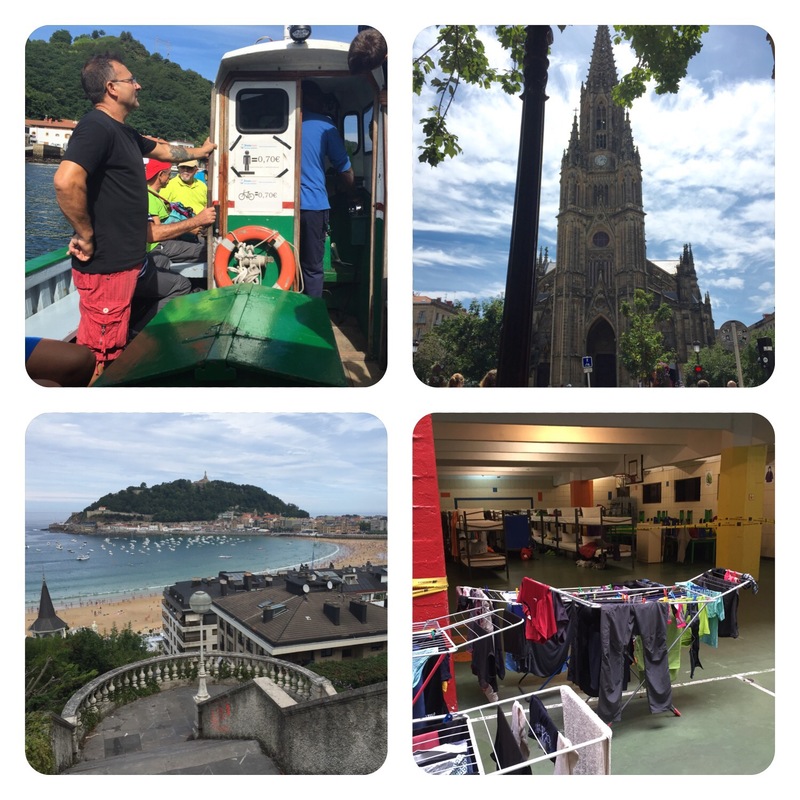 I used the day to get some sightseeing in–Bayonne is part of Basque country and has a beautiful cathedral. The city was teeming with tourists. Its population proper is around 50,000 but the greater area has some 300,000 people. They invited me both for lunch and dinner, and we played games late into the evening–one a scrabble-type game but with numbers. To lighten my load, I left my jacket and a pair of trousers. And Seniora Socorro was nice enough to do a load of laundry for me, with drier since rain was predicted for the night. I still need to sort out my next move. My timing isn’t very good at arriving at the destination during their “open” hours. After a sandy ordeal for a few hours followed by an easy bike path part, all totaling 20.7 km (12.9 mi), I found the reception desk at a huge vacation resort (with a few places set aside for pilgrims) closed from 1:00 to 5:00 pm–so it’s 2 1/2 hrs lying in the grass under the shade of a tree and blogging! I took a rest at an unusually idyllic spot with bridge over a small streamin front of me–a passerby captured the moment including a rare reflection of the sun off my forehead. Walked an easy 21.2 km (13+ mi) on paved bicycle paths, but I felt the heat coming on–91 at the hottest point. The town of Capbreton has a population of 8000 plus and is a popular holiday destination for sailors, surfers, and beach-goers. At some places along the walk, only a large sand dune separated me from the ocean. I called for a reservation for tonight at the number listed for pilgrims and as I got closer into the neighborhood , a car stopped and the lady driver asked in French if I’m American. I then established that she got my message and will arrange something at her house. I’m in a nice comfy bedroom, all showered, and my few pieces of laundry hanging in the son. These beach towns amaze me–not sure why, because we have the same up and down the California coast. I guess, as a pilgrim, I just didn’t expect to deal with all the cycle traffic, the lunch places being full, and of course, lodging being scarce in some places (and costing 5 times what they should). The flip side is there are lots of places to rehydrate along the way. I’ve carried no more than a pint of water and a little overflow in the fold-up bottle (Douglas’s). Last night’s place was on a lake and I saw a few beautiful views of it as I left this morning (one pic included). The path this morning soon turned ugly as it took me through some very powdery sand–like walking on a beach. I had to get to my destination by 5:00 pm, so I was stressing out–walking on sand is VERY slow. 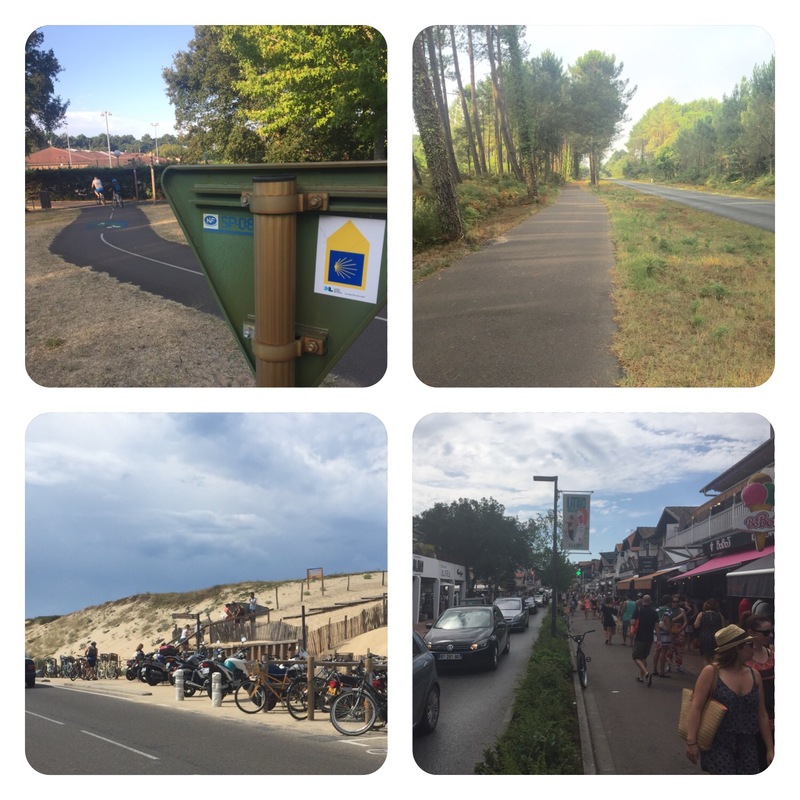 But at the 1/3 point I cut over to the paved road and the last half was on a dedicated paved bike path with hundreds of vacationing families cycling their little hearts out–I was the only walker! Pics included. I’m staying in CBE (Compagnons des Belles Etapes, probably for people who travel along stages of an itinerary). The place is a huge two-story building with lots of 3 or 4 bunk rooms. I have one all to myself. The town of Vieux Boucau les Bains decided to build an artificial lake to enhance their tourism. Its population swells from 1500 to 10 or 15 thousand. I went the kilometer into town and can attest to its swelling! Amazing tourism. 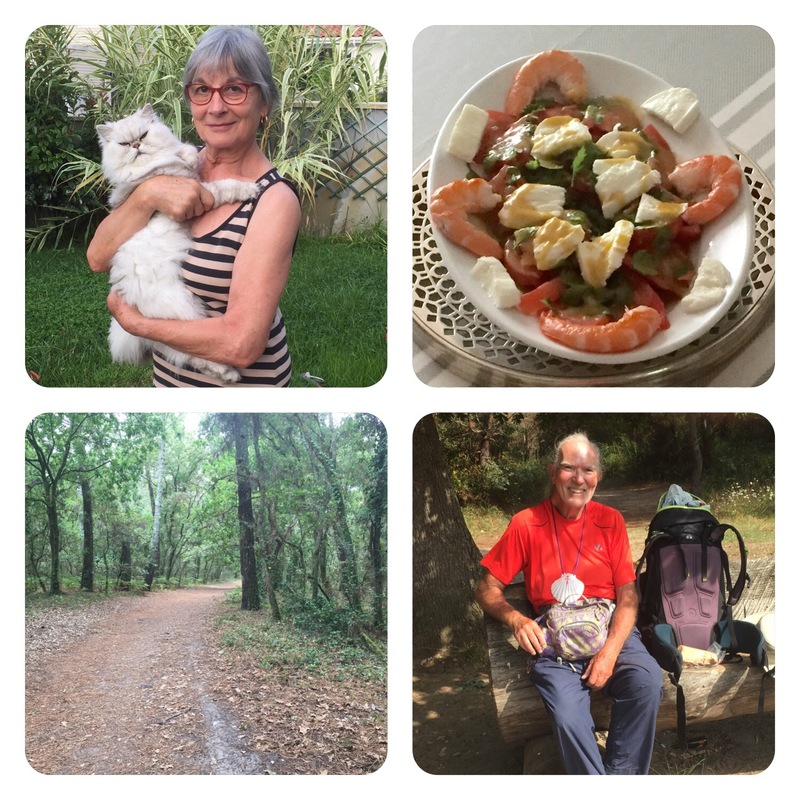 I walked the Chemin de Compostelle route to get close to the ocean. But rather than being an 11-km day, it turned into a 20 km day (12.5 mi). But well worth it to see the goings on: stores, restaurants, campgrounds, and kiddie rides. I just wanted to stay there and relax but realized I had another 10 km to go in the warm sun. I’m now at the Le Col Vert campground on the deck of a beautiful mobile home quite the opposite of last night where I had no water or electricity. When I arrived at the campground there were 40+ people in line at the reception. I wasn’t worried about not getting my lodging because you need credentials to qualify for the 10€. Theirs was costing upwards of 60€.